(2006 – present, ongoing) – Having witnessed multiple mortalities of birds entangled in discarded fishing gear and other trash on rookery islands over the years, we initiated this effort in 2006 to engage volunteers from the public and from other agencies with a stake in natural resource management to clean shorelines of important waterbird rookeries. The cleanup has grown considerably and now focuses additional effort on important shorelines where birds feed in addition to the rookeries. 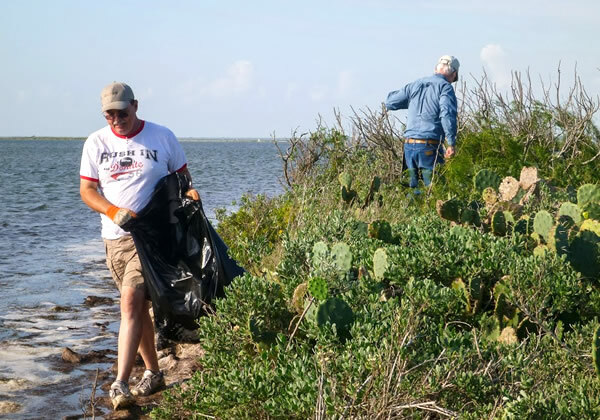 Many hours of in-kind work and equipment are provided by the volunteers and US Fish & Wildlife Service, Texas Parks & Wildlife Department, Texas General Land Office Oil Spill Response Division, US Coast Guard Auxiliary, City of Corpus Christi’s Solid Waste Dept, and others.